So, this post comes to you from my hometown of Elmsford, NY, where I am typing away in the house I grew up in. I am in town visiting my family, and will be calling this my home base for the next 8 days. This Tuesday I am flying to California for a business meeting with other librarians, and will be flying back on Friday--flying out of and into JFK, which made for a great excuse to spend time at my NY home. If you had told me 5 years ago that I'd travel this much as a librarian, I'd have thought you were nuts. But, clearly I would have been wrong... trip to Cali, paid for by my employer? I'll take it. In other news, I am just coming out of one crazy busy week. It has been hard to keep my head screwed on straight, but thank God I have managed not to drop and shatter any of the plates I'm keeping in the air at the moment. In a welcome shifting of gears (welcome because it was a shift from work to family, though for a reason that is sad and still hard to process...), today I attended a memorial Mass in honor of my grandma, Rosa, who passed away a year ago (may her memory be eternal). A good friend of hers, Phyllis, drove to the Mass with us in my mom's car, and in thanks she gave us some of her knitting, because she is kind like that. The knitting really reminds me of my grandma, because she used to knit things for us before it became too hard on her eyes. The knitting from Phyllis memorialized my grandma perfectly, for me. I also got to see and spend time with my uncles, aunts and cousins, which was a real blessing. 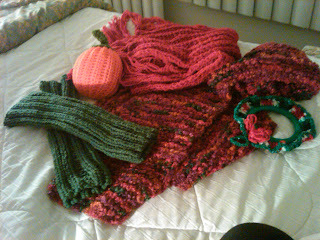 Leg warmers, a nifty pumpkin, a bright red scarf, a pretty multi-colored scarf and hat set, and a knitted Christmas wreath--all knitted by the lovely Phyllis. I believe I have another pumpkin like that somewhere, which my grandma knitted for me maybe 10 years ago. If I can find it, the pumpkins can be friends on my shelf, like Phyl and Rosa. On to more bookish things, I am excited to report that on my plane rides to and from California this week, I plan to dive into Harry Potter and the Deathly Hallows, a much anticipated reread in preparation for the first Deathly Hallows movie, coming out November 19th (!!!). I also hope to post my impressions of The Hunger Games Trilogy sometime soon... I have a post in draft about it, just waiting for me to compose my thoughts! And now, here are this week's Thursday Book Questions, Pt. 6. For previous installments, see Part 1, Part 2, Part 3, Part 4, and Part 5. Oh man, I don't cook often enough to have a good answer to this. Though, I have cookbooks which, in the past, have been very helpful to me, and so they are likely to be the ones I will return to when I manage to work cooking back into my lifestyle (ha). They are, Nourishing Traditions, 30-Minute Meals by Rachael Ray, and the blue Lenten cookbook, which is a staple in Orthodox homes. There is a Lenten pumpkin bread recipe from that book which is way too delicious to be considered Lenten. This is a hard one, because I read a whole slew of books last spring, which I didn't keep track of. In answer to this question, I guess I would have to say The Way to Nicaea by the Very Rev. Dr. John Behr, which I read over the summer as part of my graduate studies. The reason this is inspirational, though, is perhaps not typical: in this book, Fr. John does the kind of theology--or more precisely, he close-reads primary texts of the Early Church Fathers--in a way that I aspire to emulate. It's the kind of work I want to do whenever I attempt to reflect on theological matters by way of primary texts (the best kind of reflection, when done right, in my opinion). His methodology is impeccable and yields such insight, that both the insight itself as well as the methods he uses to get there, are very inspiring, at least to this theology geek. Eventually I'll post my specific impressions of this book as well (ah, all the posts waiting patiently for me to compose them). This is a tough one, since I'm not exposed to a ton of book hype, except in the YA fantasy realm, mostly because of the blogs I read. And in each YA fantasy instance, the hype was spot on--Harry Potter and The Hunger Games being the two best examples of this. I hope to read the Twilight series sometime in the next year, and there is so much hype, both good and bad, surrounding those books that it will be interesting to see how my experience aligns with the various schools of Twilight hype. Again, don't generally read book critics. Whenever possible, I like going into an experience cold--whether it be a book, movie or piece of theatre. Don't read Twilight!!! It shall taint your view of YA novels! I'll be interested to hear what you think of Twilight! And as someone who wanted to like the Hunger Games books much more than I actually did, I'd love to hear what you loved about them. You like stories for so many of the same reasons I do; you might have insights that I missed.